I have been repetitive in the use of certain ingredients in my kitchen. And basil is one of them. The reason is that growing and using Italian basil is a recent thing and the novelty or love of trying it out in varied dishes will (always) remain. I have been following the pesto trail on the Internet and stumbled upon this beautiful braided bread that begged to be baked! Going through several sites, I finally settled for the recipe from The Kitchn. With the link to the recipe given above I won’t be adding the recipe here. I followed the recipe without any tweaking. The quantity of the ingredients was for two loaves of bread. I didn’t make two braided loaves of bread. One half of the dough sits in the fridge for another kind of bread. Maybe in a couple of days. Basil happiness in my potted garden. I did some prepping yesterday with the pesto. My potted basil plants are about to bloom (some are blooming already) and some of the leaves are curling up. Not good. The pesto I made for this bread is thicker than the one I usually make. It was also a good thing to finish off the cheese I had in stock. No, it wasn’t Parmesan but a herbed cheese that had been lying around. Came to good use as it thickened the sauce making it easier to spread on the rolled-out dough. You need to roll out three rectangular pieces of dough and spread the pesto on each keeping the edges free of the sauce. Then these are rolled up into tubes. Each tube is cut vertically so that that lovely shade of green is visible. Then the cut tubes are braided into a loaf of bread. I did the braiding on my work surface since I wanted to use a loaf tin for baking. The tin was lined with greaseproof paper and the braided bread sat there till it rose before being baked. Brushed with an egg and water mixture, the bread went into a hot preheated oven at 200C. Ten minutes later, the heat was brought down to 180C and baked for another 30 minutes. In between, I turned the loaf tin around. What faced the back of the oven faced the front. 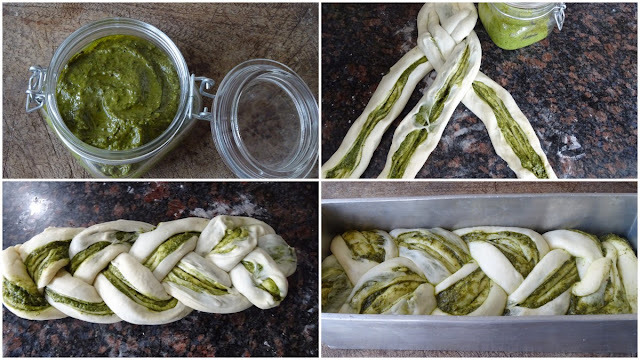 The fragrance that filled the house while this braided bread was being baked was nothing short of amazing. And the taste? So delicious that I might find myself baking another one soon!